Panzerkampfwagen VI Tiger ausf E (SdKfz 181) Turmnummer (Turret Number) 313, 3.Kompanie, 1.Zug (Platoon) 3rd Vehicle, leads another Tiger of Schwere Panzer Abteilung (Heavy Tank Battalion) 503 that has stopped to confer with panzergrenadiers of 3rd SS-Panzergrenadierregiment "Eicke" of the 3rd SS Division "Totenkopf" (Death's Head) as they attack Chrustschtschewo-Nikitowka during the Battle of Belogrod on August 13-14, 1943. After the failure of Operation Zitadelle (Citadel) to take the city of Kursk in July 1943, substantially reduced German divisions withdrew to their previous positions around the town of Belogrod. Schwere Panzer Abteilung 503, over the commander's protests, was ordered to attach its three companies to three SS Panzergrenadier Divisions. This had the effect of blunting the Tiger force available and left the tanks without mutual armored support. 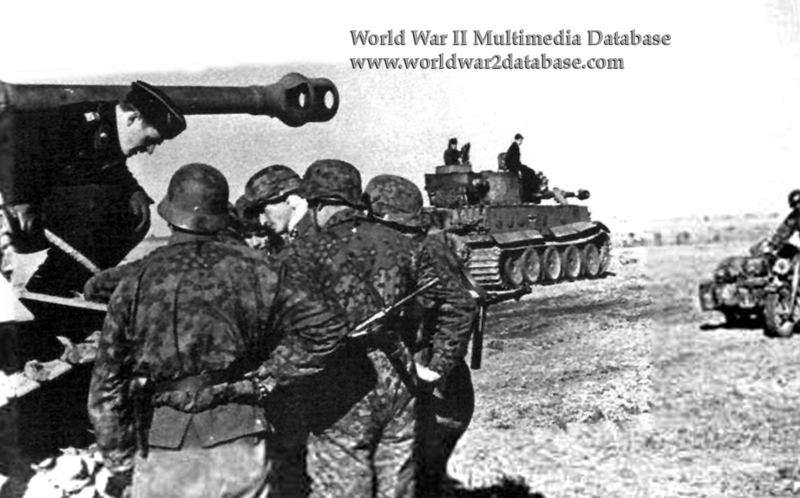 Outnumbered ten to one, the Tigers, Panzers and Sturmgeschutz assault guns used their superior training and tactics, and the heavy armor of the Tigers, to assist "Totenkopf's" drive on the Merla River to link up with elements of the 4th Panzer Army. Despite forcing the Germans to withdraw from Belogrod on August 6, the heavy Soviet tank losses prevented the total destruction of the German forces. Between July 5 and August 7, 1943, Schwere Panzer Abteilung 503 claimed to have destroyed 385 tanks, 4 assault guns, and 265 antitank guns. On August 13 alone, Tiger 332 knocked out three T-34 medium tanks, two KV-1 medium tanks, one SU-122 assault gun and five antitank guns. The Battalion lost one tank and Leutnant Weinert was wounded.